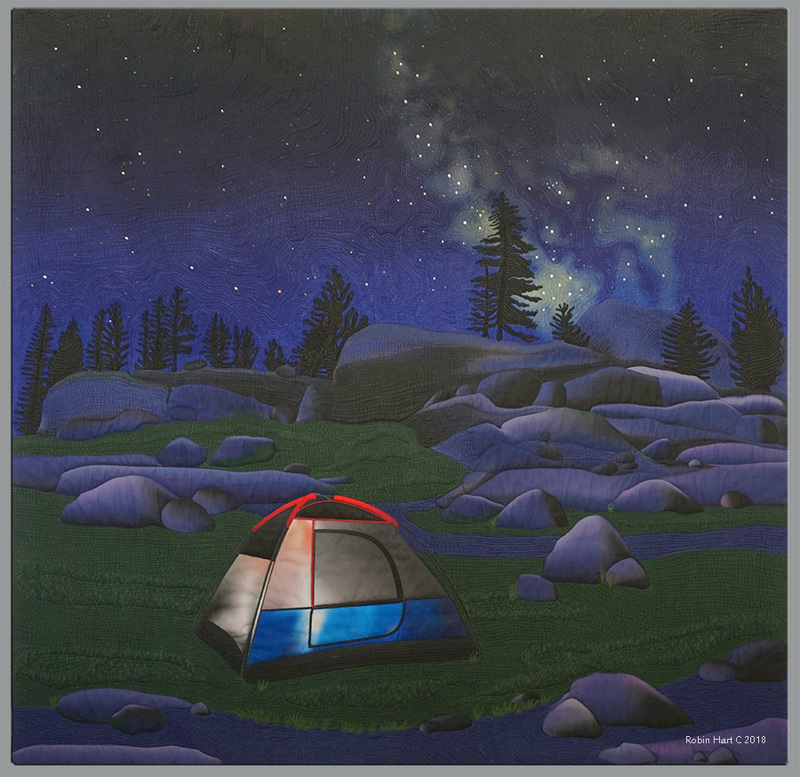 This quilt was inspired by my experiences camping and viewing nature under the starry sky. I spent time this Summer planning out the composition and subjects, photographing the night sky, and a tent with illumination in it. I then drew all the objects in Adobe Illustrator, also using photos I had taken of the scenery at Loon Lake as inspiration for the landscape, changing the colors to complement a night scene. When the image was finished, I had Real Graphics output it on cotton cloth on their large format printer. I created this piece with the intention of heavily thread painting it, with colors complementing the subject for texture and design. It is quilted, sandwiched, with batting in between. I have used crystals for embellishment of the stars. The sky is an accurate depiction of the stars, planets, and Milky way as seen in August, as I used my photo in the background, while I was drawing the stars and planets to position them properly. I have randomly put the crystals in to simulate star shimmer.